Different with a capital tea: 1907, Perth. Gone are the days where it’s hard to come by a fail safe bar in Perth. From dimly-lit, quirky basement bars to cosy, couch-filled spaces, brace yourselves – the cocktails are coming. Just down a (you guessed it) lane off Murray Street, The Laneway Lounge boasts a killer live jazz scene, alongside top-notch eats and a 17-page beverage list brimming with choices. Dine while watching local and international performances or hire a private booth for an intimate gathering. With exposed bulbs hanging from the ceiling, Laneway knows how to give good light. The stellar cocktail list. 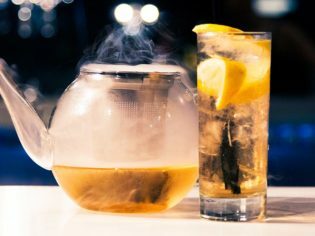 Pick the Nitro Punch for wow factor – it comes served in an antique punchbowl overflowing with mystical liquid nitrogen. Antique mahogany lounges and leather-bound books (are we in Ron Burgundy’s den?) create a chilled out vibe at the bar, housed below the historic Parker & Parker Building. Coming in on Perth’s initial wave of small bars, Andaluz was one of the first to bring excellent tapas to hungry Perthites. European flavours, with a strong flavour of Spain, meet an impressive drinks list at what is a firm favourite amongst Perth suits. Its prime location in the heart of Perth’s CBD. Grab a spot straight from the office. If you’re venturing south of the city, put this eccentric bar on your hit list. The cool live and original music venue lies down a set of stairs, underneath the popular Norfolk Hotel. The Odd Fellow’s Super-friendly staff, an exposed brick interior and a bright feature wall of spirits make for a cosy venue. Musos rock the house Tuesday to Saturday with band and DJ sets. There’s also spirit tastings and samplings of smallgoods. Delish. A Fremantle crowd is one of the best you’ll get for people watching. Sit back, relax and enjoy the cruisy atmosphere. Inside the basement of a 100-year-old building, whose former life was a rag trade factory, 1907 is where Old World meets New World – classic and contemporary with a bit of a twist. Relax in the elegant downstairs bar or enjoy the sumptuous seven or 10-course degustation in the restaurant above with help from staff who know their stuff. This winter the menu features dishes infused with famous Manjimup black truffles. Head north to Mt Hawthorn because The Jazz Cellar may just be one of the coolest venues in Perth right now. It’s not at all new, in fact, crowds originally queued from mid-afternoon on a Friday (the only night of the week it’s open). Lucky for us, there’s now an online booking system in place, which still sees owner Roy turning away almost 100 traditional jazz music fiends each week. Its BYO drinks and food philosophy matched with all-you-can-listen jazz means it’s a real winner amongst young and old. The décor, too, harks back to yesteryear, with enamel advertising signs and tables made from cast iron sewing machine bases. In case you weren’t already sold, check out the Harry Potter-esque entrance. Find the red phonebooth and go down the stairway to enter. Tres cool. Set amongst Perth’s ever-popular Brookfield Place area, Bobeche evokes a clandestine feel. Its dark and velvet interior with luxurious chesterfields welcomes you in from the cold. Grab one of the signature teapot cocktails which change regularly. The pick for winter is the Hot Coconut Buttered Rum, a delectable mix of Bobeche’s secret spiced coconut butter batter, Pampero Anejo Rum and a little hot water. It’s served warm and only available in the cooler months, so get in quick. We’re (only slightly) ashamed to admit it, but the free bowls of popcorn are another drawcard. You can smell the warm buttery scent from outside. The latest from hospitality trailblazer Clint Nolan slipped into the Northbridge bar scene shrouded in mystery – where is Sneaky Tony’s? How does one get in? Thankfully, things are now a little clearer due to word of mouth. The moody American saloon/speakeasy-style bar is filled with rum, rum and you guessed it, more rum. Don’t even try asking for a vodka soda. To get through, find the unmarked door around Chinatown and look for a pair of eyes hiding behind a peephole. Get the daily password off their Instagram account or Facebook page and announce it to enter. Need a hint? The dimly-lit downstairs haunt shares a kitchen with Nolan’s other venture Pleased to Meet You. The accomplishment! You found it, you experienced Tony’s. It’s just so cool, Melbourne might need to watch its back. Final hint: the location rhymes with Mick’s Mane. Enchanting fairytale-inspired wall art and chatty barfolk: Wolf Lane, Perth. Situated in a cluster of small bars, the quirky Wolf Lane is where Red Riding Hood got lost and decided to take a seat at her closest watering hole. Enchanting fairytale-inspired wall art, chatty barfolk, vintage furniture, bare brickwork and plush red curtains all evoke a warm and inviting atmosphere. Sink into one of the ridiculously comfy couches and you may just stay all night. Drop the special password of ‘moon’ for a selected $5 beer, cider or spirit of the week. CBD bar fave, Varnish Bar, Perth. When underground specialist whiskey bar Varnish hit the CBD, it was clear – Perth was growing up. Below the heritage Smithmore House with an easy-to-miss entrance, Varnish offers punters a range of more than 200 whiskeys from the US and plates up excellent food. Aim well enough and by sinking a gold coin into the tin can tip jar hanging behind the bar, you’ll get a prize – as for what that is you’ll have to ask the bartender. Don’t forget to say hey to Justin Beaver, the bar’s taxidermy mascot. You can’t go past Varnish’s bacon flight. Four types of the good stuff with four whiskey selections. An unusual but delectable match made in gourmand heaven. Follow the spiral staircase down to an airy casual space for Lalla Rookh, which dishes up contemporary food and wine in an easy-going setting. There’s a great selection of vino too and five relaxed spaces in which to unwind. The Italian eating house’s arguably short menu, which changes seasonally, includes tantalising traditional fare and a selection of cheeses and cured meats. The Wine Store, where you can purchase bottles to take home or enjoy at the venue. There’s more than 300 labels housed inside and sommelier Jeremy can source specifics for the collectors. This list is very helpful for me right now that I am back to Perth. Will check some of these bar out, thanks for sharing!